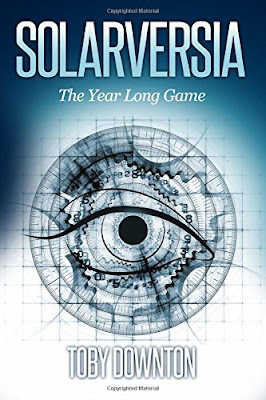 Solarversia is the story of an epic year-long game played by 100 million people inside a virtual world modelled on the real world Solar System. Given three lives, three vehicles, and told to master The Science of Solarversia to stand a chance of winning, players compete for the £10m grand prize, and the chance to help design the next game, starting in 2024. Nova Negrahnu and her friends Burner and Sushi cannot wait to start playing. But when an international terrorist organisation sets its sights on the game and it’s creator, Nova finds her life turned upside down, as the line between simulation and reality blurs. Can she navigate between playing the game, coping with all the issues an eighteen-year-old girl faces and avoid the very real and present danger mounting outside Solaversia? Sci-fi isn't usually my thing. I mean, I'll read it (of course, I'll read anything) but it takes something really special for me to give a predominantly sci-fi book a five star rating. On top of that, this book is billed as the next Ready Player One, another book that I haven't read. But despite all that, I really enjoyed Solarversia. What I liked most about this book was the quality and detail of the writing. The author had obviously gone to great lengths to root his idea in the real world, and his research is clear to see in the concepts discussed within its pages. But it's not just that. The world itself is spectacular. Worlds within worlds, reality combined with myths, legends and folklore from an imaginary planet and races of creatures - all made up, yet all meticulously thought out and seamlessly integrated with reality. And that's just in the game part of the story. I think the thing that drew me into this book the most was this blending of fantasy and reality. Solarversia blurs the line between the two in every way possible, turning everything upside down and making you forget what's real and what isn't. And what's even scarier - at the rate technology is advancing, this could all become reality sooner than you might think. Another thing I liked was the setting. Fantastical worlds aside, the real-world part of the story was predominantly set in the UK. The main character, Nova, lives in Maidstone (or the 'Stone, as it's referred to in the book) though she moves away to university in Nottingham partway through the book. I've said it before, but I still find it a nice change when books like this are set in the UK. Nowadays when places are namechecked in a book, 90% of the time they're in the US, so it's nice to imagine the events of the book happening in places I'm familiar with and (in some cases) have visited. It all helps to make the book even more real for me, which in the case of Solarversia confused the boundaries between the game and reality even further! The plot twists were unexpected - without giving any spoilers, there were a few big things that really took me by surprise, as well as a few little things. I have to say that I liked certain characters a lot more than others. I felt characters like Burner and Charlie could have had a lot more of a part - even minor characters like Jools van der Star could have featured a lot more. I know Downton is keen to pursue the Solarverse, so maybe their backstories will be explained further at some point in the future. Or so I hope, anyway. Solarversia is available to buy now. If you want to hear more about the Solarverse and the year long game, visit the website. Have you read Solarversia? Will you be signing up for the game? Let me know in the comments below!